Example of one of the BMO200 fountains. This project is the BMO200 Fountain, a creation that celebrates the 200th anniversary of BMO, a bank in Montreal. The creative director of this project is Jess Willis of Mosaic. This project involved not only people of the design firm and the production company, but also members and employees under BMO. BMO’s CMO, Connie Stefankiewicz. Jennifer Marman and Daniel Borins were also artists involved with the project. 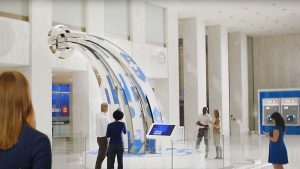 In order to celebrate BMO’s bicentennial anniversary, the company wanted to grant wishes to their customers through an interactive installation. Thus, the idea for the BMO200 Fountain came to be. The project is a sculpture that depicts water pouring into a pond. The image of water is created through mosaic tiles that flip between white and blue in order to form the appropriate imagery and icons. Users can type in a “wish” with their mobile device and then toss the coin into the fountain. This piece particularly caught my eye because I enjoy how the project is a successful combination of art, interaction and software. I believe this project required the development of custom scripts because the artists and developers of the project wanted to created an interactive interaction that didn’t involve the cliche projections or screens. They thus created a software involving a “flip side” where many discs along the fountain water form would easily flip between white and blue in order to create the appropriate images. The project designers had to configure different ways that the coin would fall into the fountain waters. The BMO200 Fountain demonstrates that interaction design is not limited to screens. Although today we see a lot of interactions involving these components, I think it is endearing to see the mosaic tiles moving to create different shapes. However, when not with the fountain, the experience is definitely not has sublime.